Images of the suspect in this morning's Lakeview burglary. A Lincoln Park man was awakened by an armed intruder and robbed during a home invasion Monday morning, police said. And a Lakeview family that was awakened this morning by their condo’s rear door alarm found an armed man pointing a handgun at their security camera—he eventually drove off with their car. Around 3:50 a.m. on Monday, an armed burglar entered a coach house residence in the 2600 block of North Burling. He woke a sleeping man while displaying a handgun. The offender demanded and secured personal property from the victim and then fled, according to a police spokesman. The intruder was a black man between 18- and 25-years-old; 5'08” to 5’10” tall, 150-160 pounds. He was wearing a white baseball cap, white sweatshirt, and a dark green puffy vest. This morning around 4 a.m., an armed intruder entered through the back door of an occupied residence in the 3000 block of North Kenmore, activating an alarm. The offender took car keys from a counter and drove off with the victim’s 2016 Jeep Grand Cherokee. 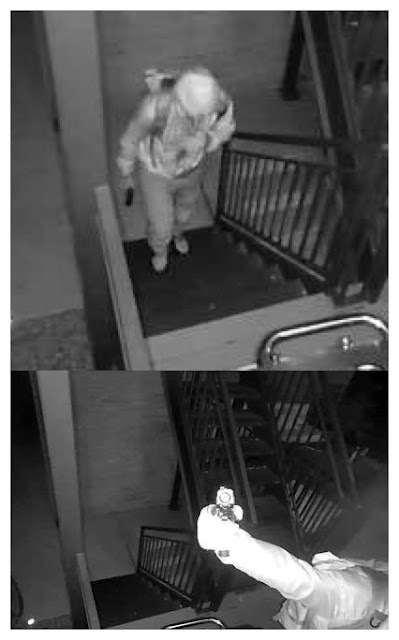 Surveillance footage shows the offender climbing the building’s rear stairs with a handgun displayed. Outside of the unit, he points the pistol at the victim’s security camera before making entry to the residence. On Sunday, a man who lives just two blocks from this morning’s Lakeview burglary captured some—How should we put this?—“suspicious” behavior on his surveillance camera. The video, recorded at 10 p.m., shows a carload of men pulling into an alley in the 3000 block of North Clifton. Three subjects crawl out of the back seat and pull up their hoodies as they run away from the camera. A minute or so later, they return. Two appear to be armed. Chicago police said no crimes have been reported in the area.